WRF’s events raise awareness and vital funds to support our work with persons with disabilities around the world. They also offer a great opportunity to meet with our staff and hear the life-changing difference that your support is making for vulnerable communities in Cambodia, Haiti, and Lebanon. On Monday, December 7th, WRF celebrated our 60th anniversary and awarded the 2015 Dr. Howard A. Rusk Humanitarian Award to Dr. John E. Sarno and Dr. Martha Taylor Sarno for their significant contributions to rehabilitation and their tireless efforts to transform disability into possibility. 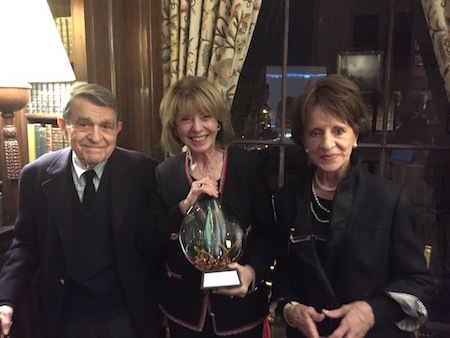 Marilyn Moffat Salant (center) presenting Dr. John E. Sarno and Dr. Martha Taylor Sarno with the Dr. Howard A. Rusk Humanitarian Award. It was a joyous evening and we are most grateful that we had an opportunity to recognize sixty years of service and commitment to ensuring that vulnerable communities, especially persons with disabilities, are able to participate fully in their communities, and to attain education and viable employment. Over the past six decades, WRF has worked in more than 150 countries and impacted the lives of more than four million people. By joining us at the WRF Spirit of Hope Cocktail Reception, you helped make a difference in the lives of persons with disabilities and other vulnerable communities in Cambodia, Haiti and Lebanon. We look forward to working with you in 2016 as we continue our efforts to transform disability into possibility.